if there is one thing that gets my family out of bed and into the kitchen in the morning on weekends it is the smell of homemade cinnamon rolls! our easy cinnamon rolls recipe has been made countless times by our blog readers and they’ve received rave reviews! they’re really simple to make, even for a novice baker – yes, there is yeast involved, but it is not as scary as you think! 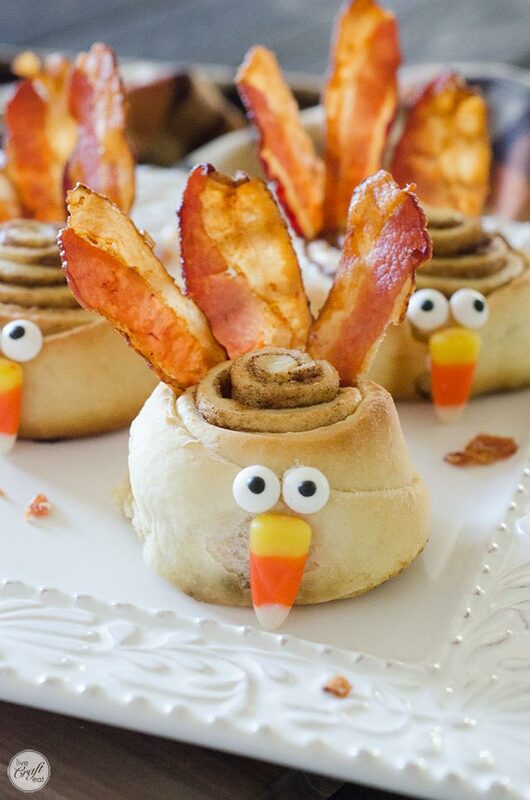 wouldn’t these adorable little cinnamon roll turkeys be the perfect thing for your family on thanksgiving morning? talk about the best day ever! 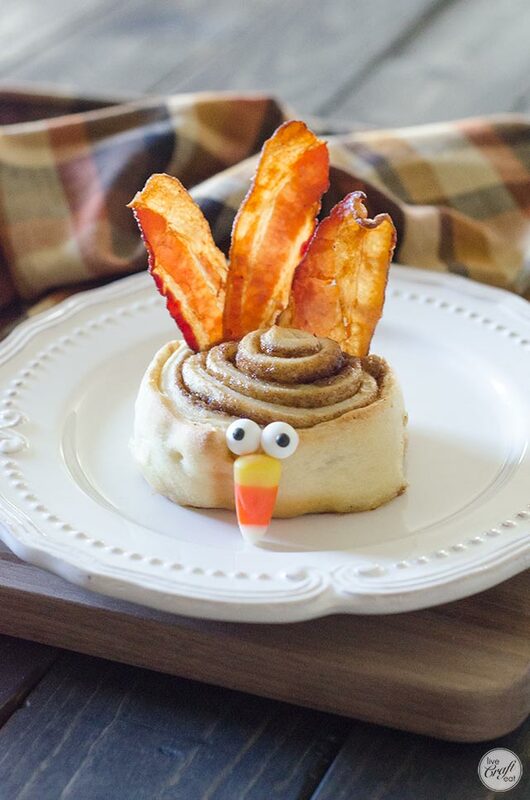 cinnamon rolls + bacon, only to be followed by turkey and homemade stuffing? “oh, but there is so much to do on thanksgiving day already, there’s no way i could throw in making cinnamon rolls too,” you say? well, you might be surprised, but you can even make these cinnamon rolls ahead of time, overnight, or even freeze the dough and all you have to do on thanksgiving morning is preheat the oven and throw them in. as for the bacon, it is really easy to make as well! you don’t have to stand over a pan while the bacon sizzles away, watching it, making sure it doesn’t burn…you can bake it in the oven! this is my favorite way to make bacon because i can put it in and go do something else for 20 or so minutes until it is done, and i have no grease splattered all over my stove and countertop. 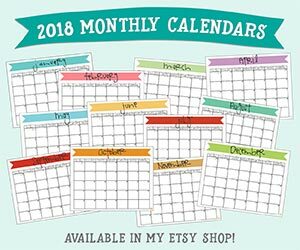 all you have to do is place the bacon on a parchment paper (aff link)-lined baking sheet (aff link) and place it in an oven preheated at 400 degrees F for approximately 20-25 minutes or until done. pull out the baking sheet from the oven and transfer the bacon to a paper towel-lined plate, and it’s ready to go! aside from making the cinnamon rolls (in advance?) and cooking the bacon in the oven, all you need to do is use whatever icing you want as glue to adhere the edible candy eyes (aff link) and candy corn beak. whether it’s homemade icing, cream cheese icing, or storebought, whatever icing you end up using needs to be thick enough to hold the eyes and beak on to the cinnamon roll. you’ll also want to wait for the cinnamon rolls to cool slightly before adding the facial features so that the icing has a chance to cool and stay put. do you and your family have any thanksgiving morning breakfast traditions? i’d love to hear them! 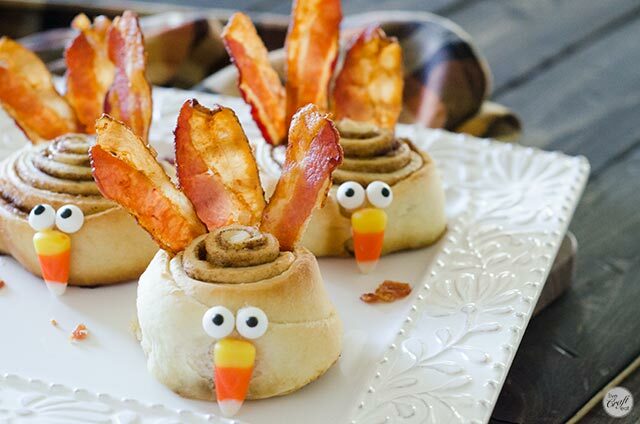 i also think these turkey cinnamon rolls would be a great addition to your turkey day!